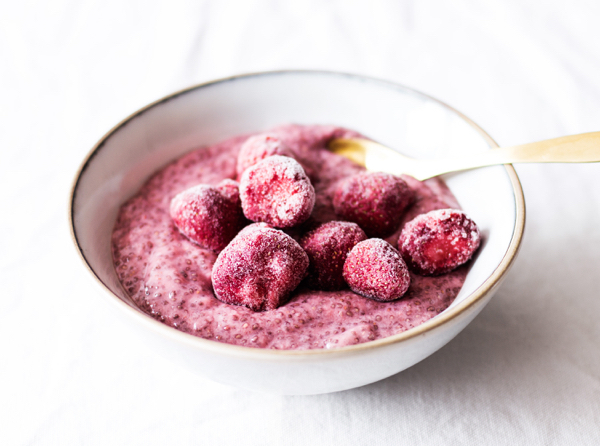 If you checked out my new recipe tab yesterday, then you probably noticed that I have a whole section devoted to chia pudding—one of my quickest, easiest, and most beloved breakfasts. 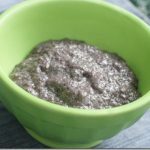 This week, I decided to make my first chia pudding of the year a new recipe. 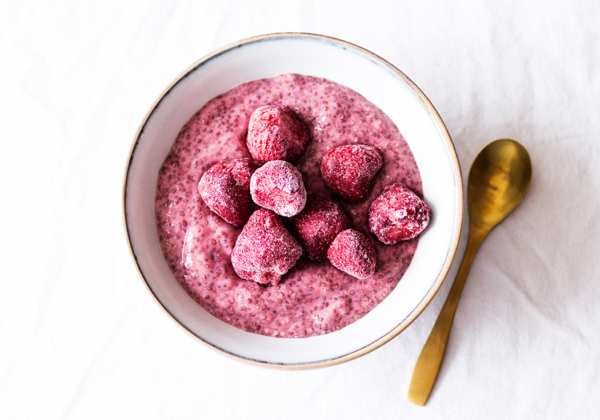 Strawberry ginger chia pudding might sound like an odd mix, but it turned out beautifully, and it’s a new favorite. 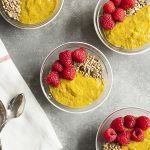 This pudding uses just enough ginger to add unexpected flavor to the chia pudding, but certainly not enough to overpower or add heat. If you like, you can also add a dash of cinnamon, a pinch of cardamom, or even some nutmeg. The recipe will also be great with blueberries in place of strawberries! Blend the strawberries, milk, ginger, and sweetener together on high till smooth. Pour the mixture over the chia seeds in a mixing bowl. Stir and allow the mixture to sit for 10 minutes. Stir again, then transfer to the fridge for 1-2 hours (or overnight), until it has a thick, pudding-like texture. Serve with extra fresh strawberries if desired. Leftover chia pudding can be stored in an airtight container in the fridge for up to 3 days. A pretty breakfast, no? And also high in calcium, protein, and essential fatty acids. I recommend serving it with a ripe banana and some chopped strawberries. If you’re on a higher protein kick, feel free to add some hemp or rice or pea protein to the mix! What chia puddings and salads are you guys making for the new year? Tell me all about it! Chia pudding is my favorite breakfast post-workout. I’ve done it with banana, pears, and peaches (separately… but I bet it would be good together!). I like to heat the in the winter – 20 secs in the microwave and it tastes like a cobbler! Side note: I made a lentil loaf based on your sweet potato version. Mine’s posted today (with credit to you). Thanks for the inspiration – it was incredible! My favorite chia pudding is a blended one with pumpkin, ginger and molasses. But I also love vanilla/cardamom and sliced strawberries and my new fave, chia nog pudding! It’s great both blended and shaken. It’s great with my own cashew nog or So Delicious Coconut nog. It’s just plain great. So where are you posting from these days? Back in DC yet or are you in NYC still? NYC for a few more days. Oh dear! Try half seeds, half rolled oats. Ok you just gave me a ridic craving for strawberries in the middle of winter. Not exactly seasonal but I think I need to pick some up because they look awesome! 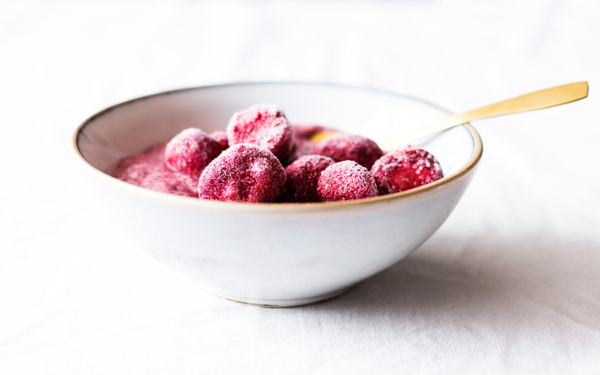 I just used frozen blueberries – still good! This year’s salads will be wonderful and different for one very important reason: they’ll be primarily portable! I’m going to start taking them to work. I’ve never been one to take pre-prepared meals to work. I’d usually just piece together a meal with a bunch of components like raw veggies, then handfuls of nuts, then fruit. Something like that. But now, I’m going to make pre-made salads and collard wraps for work. Emphasis will be on the hippie (and cheap) essentials: raw sunflower seeds, plump raisins, maple marinated Vermont tofu, pea sprouts and broccoli. Lots of kale and romaine for the (super) base. I’m kind of into this Braggsberry dressing Braggs (http://www.bragg.com/products/bragg-organic-braggberry-salad-dressing.html) is making because I don’t like oil-based dressings. I wonder how I can replicate it. I am so glad he likes the sounds of it!! I’ve been neglecting chia pudding recently. Thanks for the reminder, I love ginger and can’t wait to give this one a go! This Chia pudding looks awesome! and salads are always wonderful. I’m really into your asian dressing with cucumber “noodles” these days. I’ve had that 3 days in a row! Haven’t made pudding in ages. Thanks for reminding! Oh I think ginger and strawberry is a wonderful combination but then again I love ginger and think it goes with everything. I even just chopped some fresh onto my salad with raw garlic kraut! I’ve actually just started appreciating chia puddings. I wasn’t a fan of the goopy texture at first but I’m coming around and your delicious flavors help! Thanks. Just made some pumpkin chai chia pudding today! Love the flavor combo you just created! I agree with Ricki-strawberries and ginger sound like a fantastic combination to me. I love chia seeds so I will have to try out this pudding soon! This looks amazing! I just made an single-serving portion for my lunch tomorrow and added two handfuls of spinach for the extra greens. I’d love to see another green version of your chia pudding for people who are trying to eat more veggies, hehe. Sorry to ask a waaay awkward question. If you have time one day…. 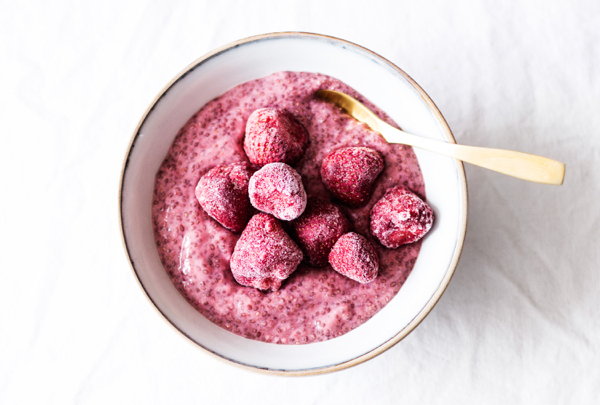 chia seeds are extremely expensive here (UK) and I am trying to work out how long they last so I can cost it out and justify the expense to our budget 🙂 as I would love to try them…….So how much WEIGHT of chia seeds provides you with a typical breakfast pudding? That way I could cost how many breakfast puddings a bag could conceivably provide….I do realise that everyone has different appetite sizes, but it would provide an extremely useful estimate. Would you mind ever so much weighing 1T of chia for me? Cannot find the info online at all. Best wishes and thank you kindly. 1 tb chia seeds is 15g. They really do go a long way, and some people find that less is more with them too. With some protein powder and some fresh and dried fruit, one tablespoon of chia in a pudding keeps me going all morning, but my appetite is _abnormally_ small–3-4 tablespoons might be a more reasonable amount. hope this helps! thank you for this lovely recipe. i have a questions – i had read that chia seeds need to be milled to get maximum benefit from them. is this true?? I’m sure there’s some truth to there being more available nutrition from milling, but as far as I know, they are NOT like flax seeds in that they will not pass through the body undigested if you don’t mill them. So you can still get many of the nutrition benefits. Ground ginger deserves to be in all things sweet 🙂 In fact, I think I might try this with my home-made pain d’epice mix, because if ginger is delicious, why not use a mix of ginger, cinnamon, nutmeg, cloves, pepper, and fennel? 😉 Thanks Gena! I, too, love ginger in just about ANYthing. That’s an interesting combo, but I’m willing to give it a shot. I’ve never actually had chia pudding before, only chia in yogurt and smoothies. Looks wonderful, I would definitely try this pudding! I’ve been enjoying raw ginger in smoothies lately for an unexpected kick. I haven’t had any chia seed pudding yet this year, but I must change that! I believe we share the same love for ginger, Gena. I would have never thought to combine it with strawberries for breakfast though! 70% of my breakfasts are chia puddings – easy, delicious, filling, omega-3 heaven. My current fave is a carrot cake variety with finely shredded carrots, coconut flour, vanilla, ginger, and cinnamon. I top it with toasted walnuts and sprouted buckwheat. It’s crazy good. 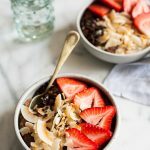 Your hemp/chia pudding is also a love of mine – I had it for breakfast! Oh, and I am loving the daily salad shots – keep ’em coming! Oh, now you have me craving strawberries too! My favorite chia pudding variations lately have been an overnight soak in leftover homemade no-caff chai, add a splash of nut milk if I have it, some protein powder, some gojis, maybe some extra cardamom because I just love it so much. Strawberry-ginger sounds just right too, though! My current salad kick is a sweetgreen knock-off: mixed greens, white beans, baked sweet potato chunks, avocado, tomato, and jalapeno dressing. I haven’t made the jalapeno dressing yet but tackling that asap. I bought “bitchin sauce” at the farmers market in December and made a decent homemade version the other day, though: almonds, grapeseed oil, chipotle, nooch, garlic, salt, and a zucchini for good measure. Very excited about it! Other happy dinner kick: barley-edamame-pine nuts-apple butter. Starting the new year with a return to more home cooking and very happy about it! i have been falling in love with chia puddings for breakfast lately. my greatest addiction is a mashed and diced pear, almond milk, chia seeds, raisins, cinnamon and maca. so tasty! you gotta try it! I like a little ginger here and there and a good idea for a warming breakfast is to add ginger. 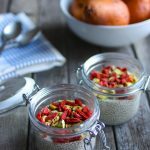 I love my chia puddings for breakfast as does the husband. I have been adding a little bit of raw coconut crystals. It’s my favorite sweetener lately. Less of a sticky mess than other things. Read your yoga post but couldn’t comment, too depressed I can’t do it anymore. So happy for you though. Still halfway through the henhouse podcast…..so far so good! I hadn’t made chia pudding in so long, but your post inspired me. I didn’t have the stuff for this combo so I came up with a raspberry lavender chia combo that was pretty amazing. I also dropped 3 clementine sections and lime zest into the blender. So so good! Thank you for the inspiration to whip up something with chia! This is my new go to breakfast! I love ginger but I’m usually dubious of adding it to dishes for fear it might overpower as you said. What are your thoughts on using fresh ginger in this? A gorgeous pudding either way! i bought two lbs of strawberries at Trader Joe’s that were about to go bad in a day or two, so this was an awesome way to use them! My husband and i loved our chia breakfast today, with blended strawberries and fresh bananas. Thanks Gena! I love ginger in pretty much anything – never thought of putting ginger powder along with strawberries. Sounds delicious! This looks amazing! I am new to chia (bought some today & googled “chia pudding”. That’s how I found your blog!) and just attempted my first pudding. It’s actually your Overnight Superfood Bowl with Chia Seeds & Quinoa, only I used oats & chocolate almond milk. I am so excited to have found your blog! Thank you for easy to follow recipes with regular ingredients that can be found in my fridge or pantry! What a delicious concoction! I’ve been trying to incorporate chia seeds into my diet, and could never imagine a more declicious way to do this. Keep up the great work. Ginger and strawberries sounds like an amazing combo! 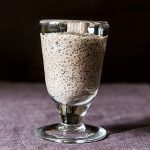 I love chia pudding for a great post workout snack! I love the use of fresh ginger in this dish (rather than crystallized ginger). I’ll definitely give this one a try!